yummy...would be perfect right now with my coffee. MMM. I love all things pumpkin. Your pictures are lovely...you have such a talent for capturing just the right "mood" of the picture...in this case...your pictures made me very hungry! Thanks for sharing...also, I've been checking your blog every day now for about two weeks...you know to see how you and Sam are doing...without asking...I remember when I was expecting my children...the #1 question was..."when are you going to have that baby? 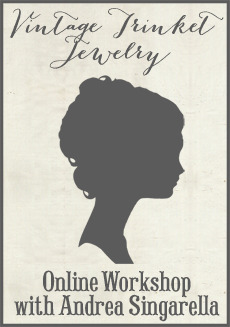 "...I know that gets tiresome after a while...so I just anxiously check your blog...we're all thinking of you...and your family...anxious as I am sure you are, too! You are so sweet yourself!!! You just post these beautiful and delicious pictures, I will make it for sure, for some reason you bring me luck in my baking adventures because I just don't have the touch for baking. I hope you saving all of your energy for the big day!!! Take care of yourself mama!!!!! I LOVE that cake! I've made it every year for Thanksgiving for the past 10 years! It's easy to make yet looks so impressive! What's nice about it too is that if you aren't that crazy about pumpkin, it's not too "pumpkiny". Good for you to still be in the baking mood! Enjoy! Sounds and looks delicious! Thanks for sharing! That cake will be the first thing I bake in my new oven! I'm off to Frederick, Md in the morning to antique and play. When I get home I'll fix the cake. 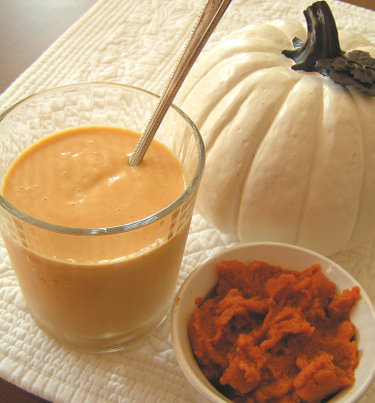 But on my way home tomorrow night I'll pick up vanilla ice cream to make that awesome looking pumpkin milkshake. It will be such a treat while I watch Grey's Anatomy from Thursday night. Glad your Mom is coming tomorrow! Keep me posted on Baby Sam Watch! The card was adorable.....the gifts were totally my pleasure!! Can I come over sometime and feed Cowboy Sam with the spoon? Speaking of spoon......I need to take it back to have it monogrammed/sp. great if you still feel like baking. Those sound delicious! What wonderful, timely treats! Okay....seriously....that looks so yummy we feel like we put on 5 pounds just looking at the picture! Great post! Haha! When I read the title to the post, I thought that it referred to the "bun in your oven"!!! I dont even like pumpkin but that all looks delicious. If you put that down in front of me I would definitely give it a try! Sounds wonderful!! Just got back from my daughters wedding weekend. So baking sounds fun. I posted the first pictures of the wedding, if you aren't off having a baby yet. Oh, it all looks so yummy! 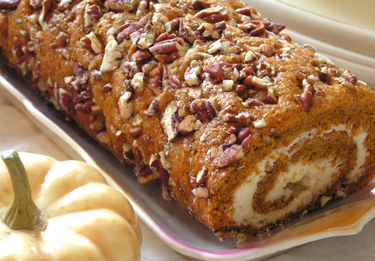 YUMMMY I adore Pumpkin roll!!! My family makes Pumpkin bars since I was little its so yummmy like a cakey bar sometimes comes out a bit custardy...with creamcheese frosting Delish! My mom can't have nuts so this Has been A Great Autumnal Favorite for years! That pumpkin roll looked so yummy when I visited yesterday I told myself if I had the ingredients in the pantry I'd make it ~ guess what? I had it all. Made it. WOW! Absolutely delicious. If your other readers haven't made it yet - it is so yummy and tastes to me just like the $2.00 pumpkin/cream cheese muffins they sell at Starbucks! 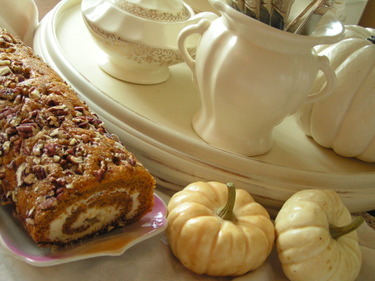 I remember making that pumpkin roll years and years ago when I was first married. It was very yummy! Thanks for reminding me of a special memory.